March 10, 1932, page 2, col. 3 & 4: History of Methodism in Chesterfield County, by Rev. J. J. Stevenson. Methodism existed in Chesterfield County from the very beginning though there was no organized charge at first. The churches were incorporated in other circuits. Chesterfield, bordering on North Carolina, was one of the first counties visited by the apostolic Asbury. On his first visit to Charleston, he, under date of Feb. 17, 1785, makes mention of spending some time in prayer in a church in Cheraw. This was non other than St. David’s Episcopal church. This old church, at this writing, is in a perfect state of preservation. Bishop Asbury was entertained by a Methodist who had moved to Cheraw from Virginia. There were then elect ladies who domiciled and cheered the itinerant. Dr. Chrietzberg mentions Mrs. Blakeney, Mrs. Blair, and Mrs. Craig. Their successors have increased during these years. Many preachers shall arise and call them blessed. From some old records it seems that there were no changes in the boundary until Chesterfield Circuit was set off at the Conference in Darlington, Jan. 23, 1832. Elijah Heddings presided at this conference and W.M. Wightman was secretary. The first quarterly conference of the Chesterfield circuit was held at the Court House, March 17, 1832. William Kennedy, presiding Elder, and John M. Kelly preacher in charge. Allen Rushing, Hugh Craig, John Stephens were local preachers, L. Ogburn, exhorter, John Burnett, M.K. McCaskill, James C. Brown, and John D. Price, class leaders. Others present were, James Wright, William Morse, C. Therell, Heyward Chapman, A. McInnis, Alex. Cassidy, Edward Odom, and Henry Wallace. The churches forming the Chesterfield circuit in 1832, were Society Hill, Mt. Zion, Sardis, Fork Creek, Smyrna, Taxahaw, Zion, Pleasant Hill, Court House, Shiloh, Bear Creek, Mt. Olivet and New Prospect. Members added to these churches during the year were 206 whites, 128 colored. The first Methodist church was built at Chesterfield in 1838 on a lot next door to Jimmie Craig’s home. His house was built in 1830. Mr. Craig sold his place for a Methodist parsonage in 1856, Simpson Jones was the pastor. The preachers lived in this parsonage until the present brick parsonage was erected, under the pastorate of J.L. Tyler. 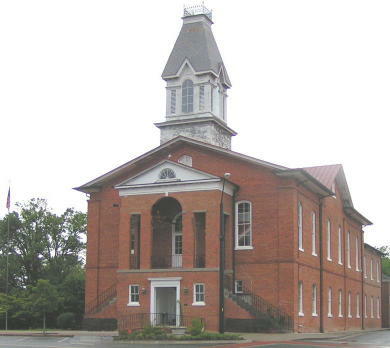 When Sherman burned the Court House in 1865, the old Methodist Church was used for a Court House it serving for both preacher and County officials, until 1877 when a new church was built on the corner of Main and Depot streets. In 1905 this house was removed and the present brick church erected. The building committee was composed of the following: Rev. J.J. Stevenson, W.J. Hanna, D.M. Barentine, Dr. D.T. Teal, and J.W. Hurst. The church was opened for services in the spring of 1806. Dr. A.M. Chrietzberg, an old pastor of 1844, preached the opening sermon. W.P. Meadows was presiding Elder. The Seventy-fifth Anniversary of Methodism was observed by the holding of the first quarterly conference, Mar. 17, 1907, this being the date of the first quarterly conference held in 1832. Dr. Ben Lucas was chairman of the committee of Arrangements. Dr. J.W. Kilgo, pastor in 1888 preached at 11 o’clock. W.P. Meadows, P.E. held quarterly meeting at 3 o’clock, J.J. Stevenson, P.C., Rev. R.A. Yongue pastor in 1891 preached at the evening services. The churches represented, with all the Stewards present, and one fourth of the salary paid were, Ebenezer, Friendship, St. Paul, Ruby, and Zoar. Thus, the fourth quarter of the first one-hundred years in the new church, was begun. The church was dedicated in 1908 by Bishop W.A. Wilson, P.F. Kilgo, P.E. From sone old papers in hand, it seems that the Jefferson circuit was set off from the Chesterfield Circuit at the Conference in Spartanburg, Nov. 30, 1887. M.H. Major pastor in 1888. This same paper shows that B.D. Lucas served this work in 1889. He is our own, beloved, Dr. B.D. Lucas. For years he was a missionary in China, but now living in his home town. The East Chesterfield circuit was taken from the Chesterfield and Cheraw circuits at the conference held in Laurens in 1908, J.A. Cook, P.C. This left St. Paul, Shiloh and Zoar three of the original churches of thirteen, which is now Chesterfield circuit, F.M. Dukes, P.C. At this writing Gobe Smith is pastor. L.E. Peeler, 1921-24 W.P. Way, 1925-29 Gobe Smith, 1930-32.
Credit is given to "The Annals of Methodism" for information contained in this article. Chesterfield County was created in 1798. However, the first mention of a Presbyterian church in the county dates from 1812, when the Harmony Presbytery appointed Rev. David Smith to preach two Sundays a month at points in Darlington and Chesterfield counties. By the next session of the Presbytery, a Presbyterian Church, now known as White Oak, had begun meeting at Chesterfield Courthouse. Little is known about this early congregation except that McNeil Crawford was the church’s “elder” and a delegate to the Harmony Presbytery in 1813. He “made known” the desire of that congregation to place themselves under the “care” of the Harmony Presbytery. That same year Rev. Colin McIver was appointed to preach to this church at least one Sunday a month. His work in the area was so successful that within a short time two additional congregations were created, Sandy Run church and Pine Tree Church, in Kershaw County. Later the Chesterfield Church merged with the Sandy Run Church and the name would be changed to Pisgah, perhaps by 1849. In 1889 the name was changed to White Oak. In 1814 Rev. McIver “removed” into the bounds of the Fayetteville Presbytery, mostly in North Carolina, taking these churches with him into that body. Sometime before 1819 the churches passed under the care of Rev. John McFarland. These two young clergy men, recently arrived from Scotland, were very popular among Chesterfield County Presbyterians because they were both able to preach to their congregations in English and in Gaelic, the native language of northern Scotland. In 1828 John McFarland was pastor at Pine Tree and Chesterfield. His address was Chesterfield Courthouse, which was the center of his pastoral work. Rev. McIver regularly preached in both English and Gaelic at Pine Tree Church. Many of his hearers could only understand the Gaelic, which was still spoken in their families and he was accustomed to preach in both. He continued to serve the Pine Tree Church throughout the 1820s. By 1844 McIver was still preaching at Chesterfield, Pine Tree, and Sand Run churches. In 1819 some “enterprising individuals” mostly from Northern States, Scotland and Ireland settled at the head of navigation on the Pee Dee River and founded the town of Cheraw. Shortly afterwards the new settlers made up a subscription of $600 and brought in the Rev. N. R. Morgan, a Presbyterian clergyman, from North Carolina, to be their minister. At first all denominations met in the old King’s (St. David’s) Church. Later the building was claimed by the Episcopalians, who expelled the Presbyterians and the Baptists. The Presbyterians then held services in the upper room of the Male Academy. Rev. Morgan was replaced in 1826 by Rev. Urias Powers. The church was officially organized in 1828 with 20 members, many of whom later emigrated to the “West and South”. By 1832 Rev. John McFarland was the pastor of several Presbyterian Churches in Chesterfield County and surrounding areas, Pine Tree, Rocky Ford, Pisgah (the old Chesterfield Courthouse Church), and Lebanon. It was noted that “he was wont to preach in both [English and Gaelic] because his people continued to worship the God of their fathers, to read their Gaelic Bibles, to chant their Gaelic Psalms”, and some of the elder of them to retain in memory the old traditions of their “native Scotland or the Isle of Skye from which some of them came”. As late as 1850 there were still nearly 50 mostly elderly citizens of Chesterfield County who reported that they were born in Scotland. The earlier total must have been much higher earlier. Rev. McFarland continued to pastor in the area until about 1844 when old age compelled him to retire. Rev. McIver died in January of 1850 in Fayetteville, North Carolina at the age of 67 Rev. McFarland died in May of 1850 at the age of 74 in Chesterfield County, South Carolina. Walter Burr Jr., Historical Sketch Town of Chesterfield and Chesterfield County SC (1981) section on the “History of the White Oak Presbyterian Church” and Dr. George Howe, History of the Presbyterian Church in South Carolina, vol. II (Columbia, SC, 1883), p. 641. Howe, p. 252 – 3. When he died in 1850 he willed his collection of Gaelic books to a fellow minister in NC. See Myrtle N. Bridges, Scattered Seed Genealogical Research Date of Southwestern North Carolina (1999), p. 226. 1850 U. S. Census, Chesterfield County, SC. Totals mine. There were also 19 born in England and 9 born in England. Myrtle N. Bridges, Scattered Seed Genealogical Research Date of Southwestern North Carolina (1999), p. 225 – 227. Ronald Vern Jackson, South Carolina 1850 Mortality Census Index (1989), p. 21.